We have previously talked about the Microchip PIC17, and its less then stellar success in the market. 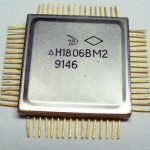 After being introduced in the early 1990’s it was discontinued in the early 2000’s, though Microchip continued to provide support (and some devices) to users for some time after that. In the early 1990’s a IC company was formed in Zelenograd, Russia (just a short distance to the NW of Moscow), the silicon valley of Russia, home to the Angstrem, and Micron IC design houses. This company was Milandr, one of the first post-Soviet IC companies, with ambitious plans, and many highly capable engineers from the Soviet times. They are a fabless company, though with their own packaging/test facilities, specializing in high reliability metal/ceramic packages. The K1886VE is Milandr’s version of a PIC17C756A, though updated for the 21st century. While mask-ROM versions are available the VE2 version replaces the ROM with modern FLASH memory. This is a upgrade that perhaps would have kept the PIC17 alive if Microchip would have done similar. It is packaged in a 64 pins CQFP white ceramic package with a metal lid and gold leads, not what one is use to seeing a PIC in. Production of these PICs continues at Milandr (the pictured example is from 2012), as customers still use the parts, mainly in industrial and other places where reliability is key. The use of a PIC in high reliability applications isn’t something entirely new. 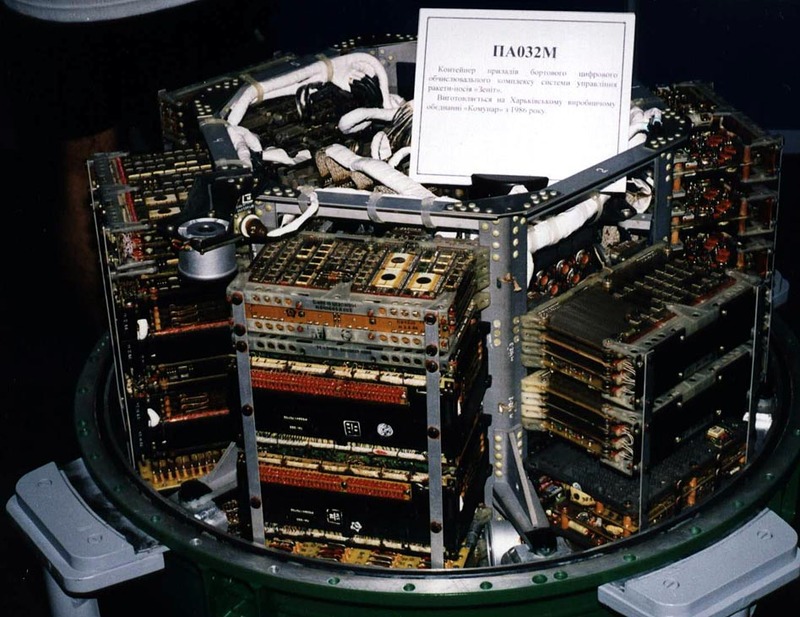 The Microhard MHX-2400 radio system, designed for small satellites such as cubesats, runs on a PIC17C756A, a version flew on NASA’s Genesat-1 in 2006 carrying bacteria samples. Milandr does offer radiation resistant devices so its likely that some Milandr PIC has flown to space as well. The DEC F-11 ‘Fonz’ implementation of the PDP-11 was released in 1979 and was DEC’s second ‘LSI’ implementation of the PDP. 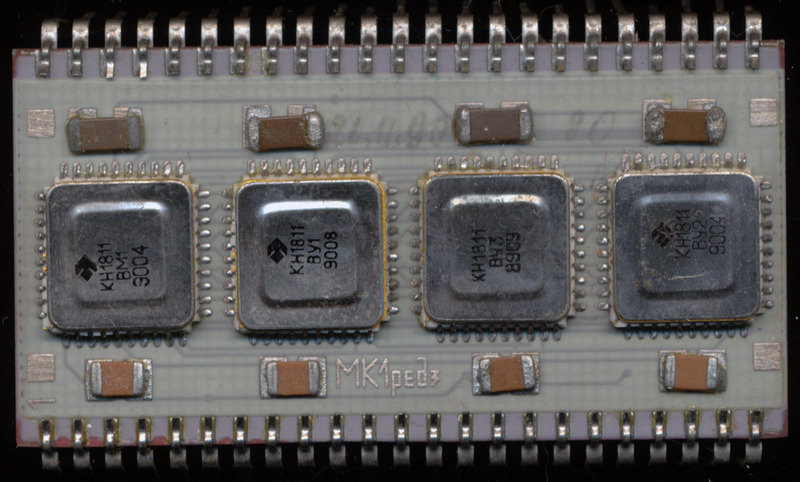 Like its predecessor it was a multi-chip implementation, consisting at its root of a data chip (DC302) and 1-9 control chips (DC303). 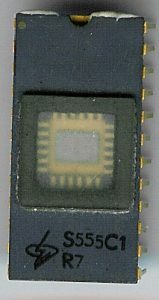 The DC303 control chips were essentially a large ROM/PLA with a few extra features added for interrupts and sequencing. 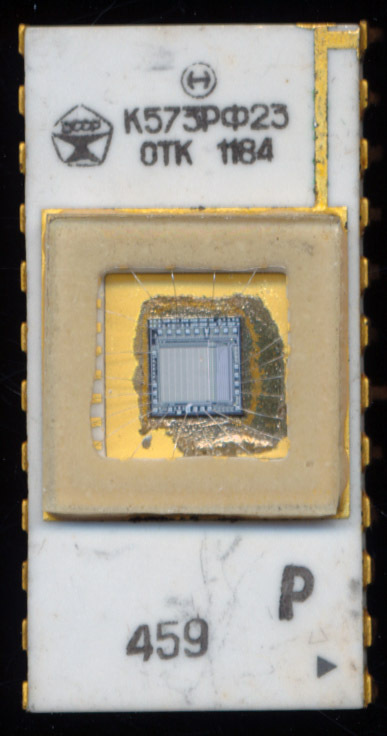 They formed the microcoded instruction set that drove the 16-bit ALU and registers of the DC302. This is why more then one were supported. Expanding the instruction set was as ‘simple’ as adding more DC303 chips with these instructions encoded. The basic LSI11/23 came with one 303 and one 302. 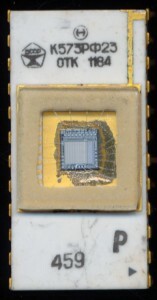 A second IC could be added to support floating point, which included a pair of DC303 chips implementing the floating point instructions. A MMU (DC304) was also supported, and required when using the FP option. This EPROM, made in November of 1984 at the Soviet Vostok factory in Novosibirsk started life as a 2716 2kx8 EPROM. A Soviet 2716 would be marked as 573RF2, whereas this particular example is marked 573RF23. 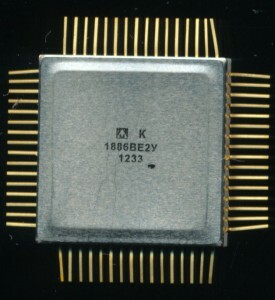 The die is a 2716 that was found to be defective, and thus converted to a 2kx4 EPROM, this is denoted by the adding of the 3 to the part number. 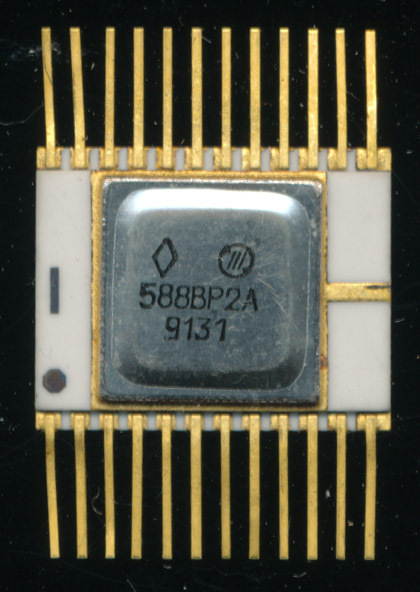 This certainly was not an uncommon procedure, even Intel regularly sold 2708 EPROMs as 2704s, whether to use a die with an imperfection, or to simply meet demand. they satisfy the demands of the state economy and the population. Meeting these conditions allowed the factory to sell such devices at a 10% premium. So not only was Vostok able to pass a defective part as a quality part, they were able to do so and make a bit extra revenue. Thats something Intel would be quite envious of. 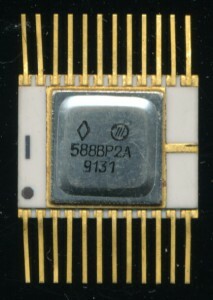 Some references show that 573RF23 as being the equivalent of a 2758 EPROM (5V 2708). This is in fact incorrect. A 2716 converted to a 2708 is done so simply by removing a single address line (going from 11 to 10) The 573RF23 retains 11 address lines, but it removes 4 data lines, thus making it 2kx4, same number of address locations, but each locations contains only 4 bits, vs 8 bits. Rewiring address lines likely did not allow for a working EPROM due to where the defect was, thus cutting the word size down. The first condition of the State Quality Mark is that said EPROM should meet or exceed the best international analog. 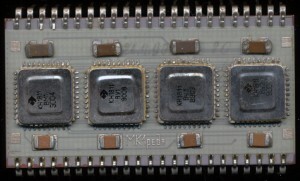 Intel did not make a 2kx4 EPROM, the closest western analog would be the Harris/Intersil IM6657, though it was made in CMOS, vs the 573RF23s NMOS, so one could say that it was easy to beat a analog that did not exist. The other mark on this EPROM is OTK, which literally means “Technical Control Department,” in others words this part passed the quality control dept, hopefully after it was converted to the lower capacity device, and them marked with the State Quality Mark. Perhaps it was the best NMOS 2kx4 EPROM the world was to see, certainly it came in a beautiful package. In the 1970’s and the 1980’s the Soviets developed and successfully flew their own version of the Space Shuttle. It was called the Buran. 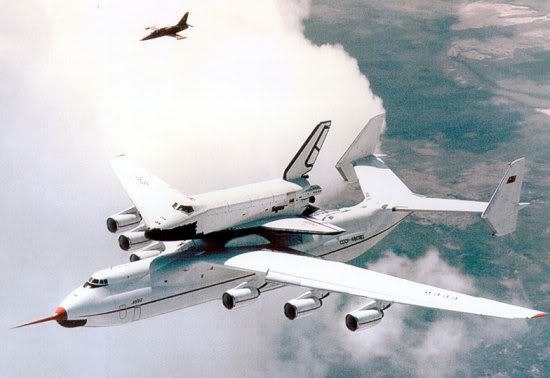 In many ways it was an enhancements of the US Space Shuttle, based on what the Soviets saw as deficiencies in the US design. One of the biggest differences was the piloting. 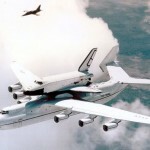 The US STS (Shuttle Transport System) was designed to be a crewed vehicle. The computers assisted the pilot/co-pilot in launch, orbit, and recovery. Many of the functions on the STS can be handled by the computers (the Flight Computers were based on the IBM System/4 Pi) but the pilot was needed to handle the rest. The Soviets, on the other hand, designed the Buran to be able to launch, orbit, and land fully automatically. This meant the computers has to be very robust, and the programming even more so. The computers had to respond quickly to chaning inputs, and be able to handle failures gracefully. While each mission would have a set profile, unknown conditions would cause deviations that the computers must detect, analyse, and properly handle. Preferably without wrecking the multi-billion ruble space craft. The main computer of the Buran is actually 4 independent systems that receive the same inputs. The clock in generated externally (with 4 backups) so that each computer is in perfect time (the STS uses software to ensure the computers are in time, rather then hardware). Redundancy is achieved by the voting system. Each computers outputs are compared, if one computers output is different, it is automatically shut down, leaving the 3 remaining computers. These computers are powered by a clone of the DEC PDP-11. The Soviet’s ‘acquired’ a few PDP/11 systems and then copied and cloned them into many different systems. 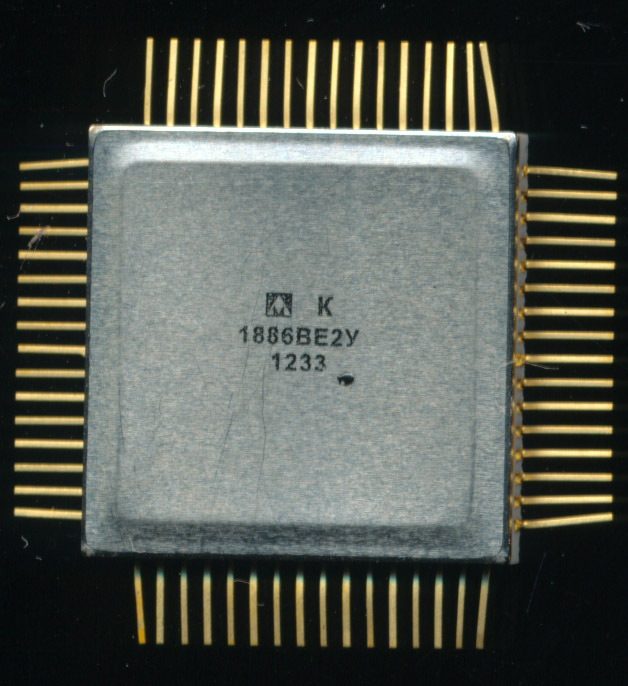 The most common is the 1801 a 5MHz NMOS PDP-11 type device. The Buran used the 1806, which is the CMOS version. Here is a general overview of the flight computer. In addition to the 1806 there were many sub-systems with their own processors. Details on these are a bit thin, however looking at other Soviet space computer designs it is very likely that many of these used the 134IP3 series of ALUs (a clone of the 54L181 TTL 4-bit ALU). This chip is also used in the Argon-16 and Argon 16A computers of the Soyuz and Progress spacecraft that are still in use today. 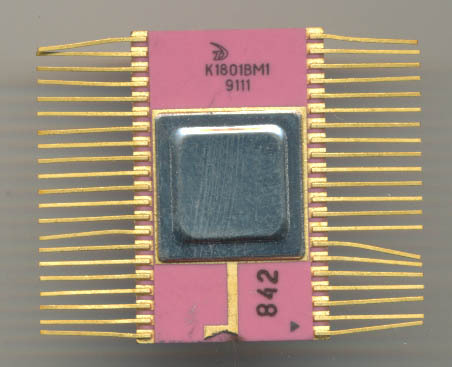 Bit-slice devices were used extensively for many Soviet designs as it gave them a great ability to design custom processors to meet the applications needs. 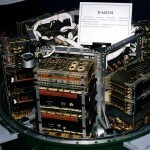 The Argon-17, which was used for anti-ballistic missile work, was based on the 583 series, an 8-bi slice processor. The C100 and C101 computers (used as weapons computers on the MiG-29) also use a BSP design. 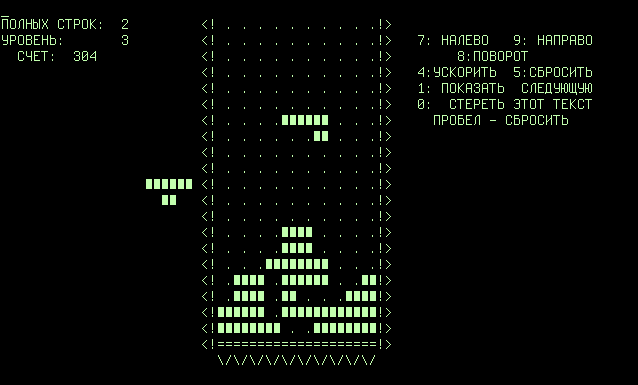 The Soviet Union’s electronic programs were mainly focused on copying and cloning Western devices. Either by simple theft, or painstaking reverse engineering. 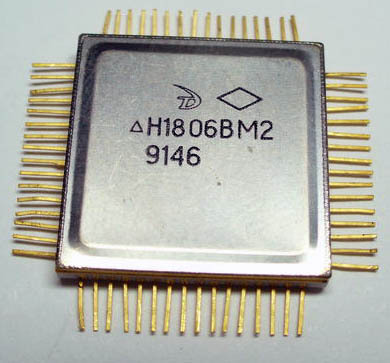 They made clones of devices such as the Intel 8080, and the AMD 2901 as well as simple TTL. 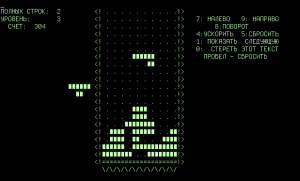 The Soviets also made many single and multi-chip versions of the venerable DEC PDP-11 computer system. Many of these have no Western analogs, they were pure creations of the Soviet industry. While Western chips rapidly transitioned into mostly black plastic by the 1980s the Soviets did not. The 8080 above was made in 1991 though looks like something from the 70’s. Black plastic is cheap, and easy to make, but it isn’t great looking. The Soviets on the other hand made some of the best looking (if not always functioning) processors of the time. Here is just the substrate (its a non finished example) of a Soviet clone of the DEC J-11 CPU. Not often do you see a brilliant blue processor. This is a nice pink ceramic Soviet PDP-11 5MHz CPU. Again this was made in 1991. Its a form of surface mount package that was used extensively for industrial and military designs. Just as the PDP-11 was used by the American military throughout the 70’s and 80’s. the Soviets used it (and now Russians) in todays times.